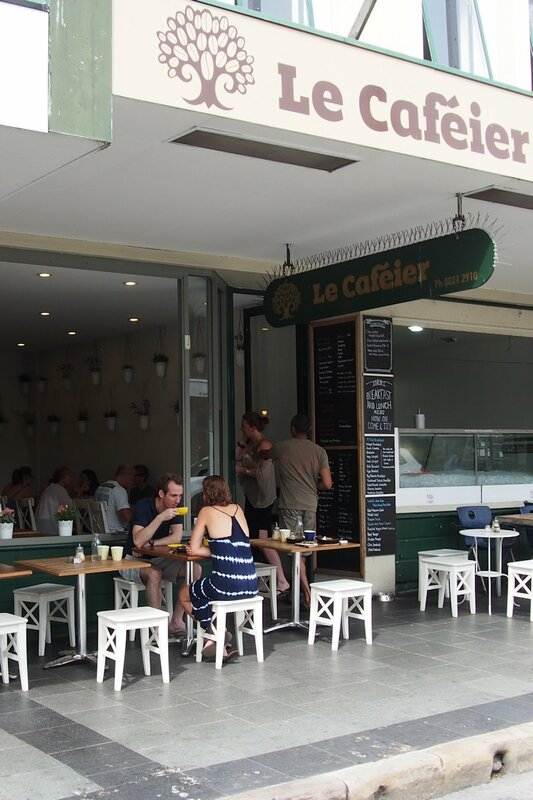 Le Caféier is a Turkish café that has been situated on Balmain’s busy Darling Street for three years. You could almost say that the site was cursed; previous incarnations of cafés and eateries only lasted for one year at most so the locals and other shop owners were skeptical when LC first opened. But as I sat down with owner Arda Dinc, I discovered the love and commitment that has gone into this café. Arda moved to Australia from Turkey to study hospitality and has worked at Centrepoint, Darling Harbour restaurants, CBD coffee shops and Centennial Park Café both behind the counter and as a chef. Owning his own establishment was the next dream that he wanted to turn into reality. It’s all about the personal touches here. From the homemade ingredients/condiments/entire meals to the ground-up rebuild of the whole interior including new kitchen, counter and self-built tables! There are still bigger plans but that’s a story for another time. The changes have worked and LC’s regulars now number in the hundreds. They get personal service and they keep on returning because of the hospitality and delicious coffee and food. Ozgur ‘Oscar’ Turkyucl is LC’s friendly and knowledgeable barista. 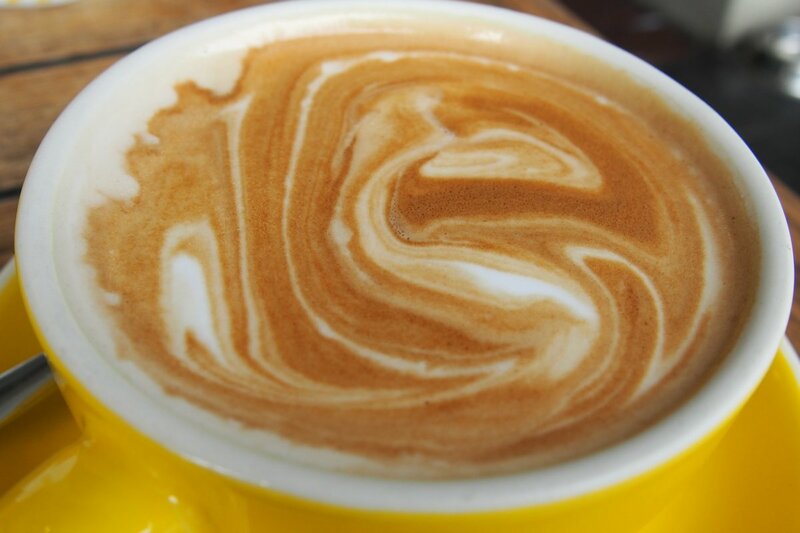 With 11 years of coffee experience, he was the obvious choice to not only make and serve the cups but also to select LC’s own blend which is supplied by Coffee Galleria (250g $13, 500g $25, 1kg $45). The resulting blend is potent and a definite crowd-pleaser. 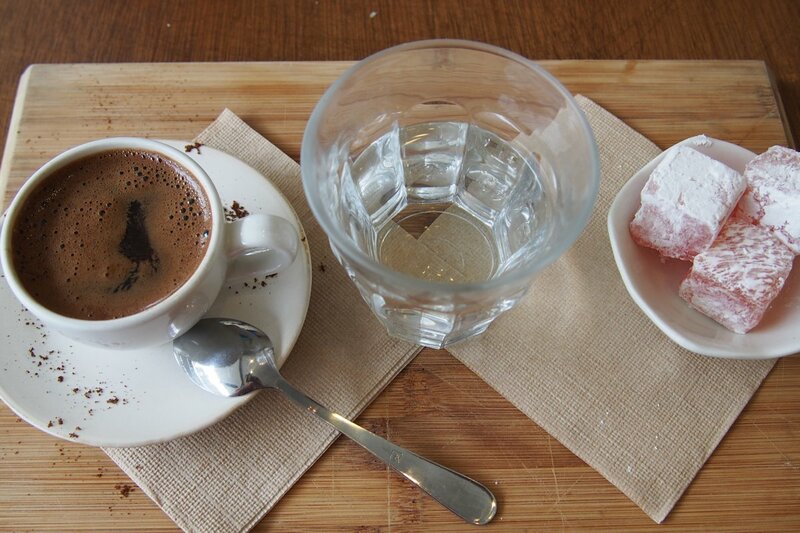 LC imports the beans for its Turkish coffee which is made by adding water and sugar to the coffee and heating it up slowly, mixing it when it begins to bubble and serving the mixture with the coffee itself still in the bottom of the cup. It wasn’t as strong as I was expecting but presents very specific and lingering bold flavours. Smoothies ($8) are available as chai honey cinnamon, mixed berries, strawberry & mango or antioxidant (mixed berries, banana and acai powder). 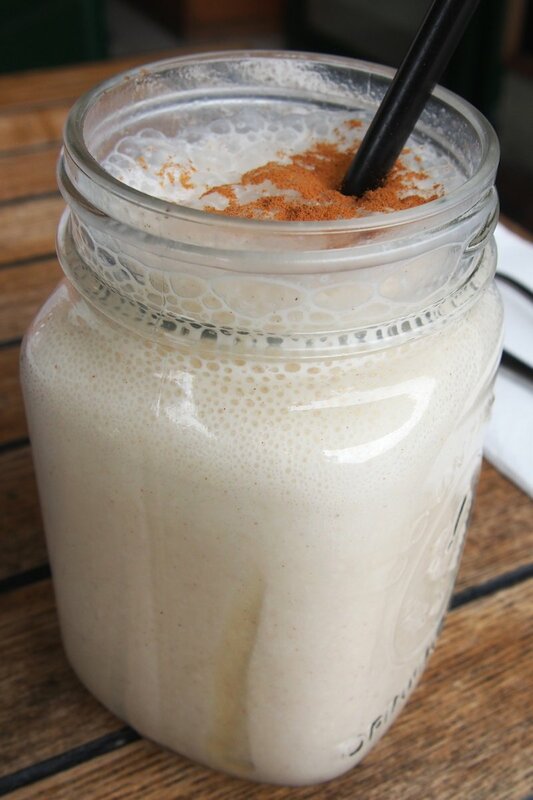 My banana and cinnamon smoothie was outstanding. Flavour and consistency was spot on so I highly recommend it. Milkshakes ($7.50) are also available as banana, coconut, strawberry, chocolate, pistachio & white chocolate, peanut butter & chocolate, vanilla, caramel or coffee. 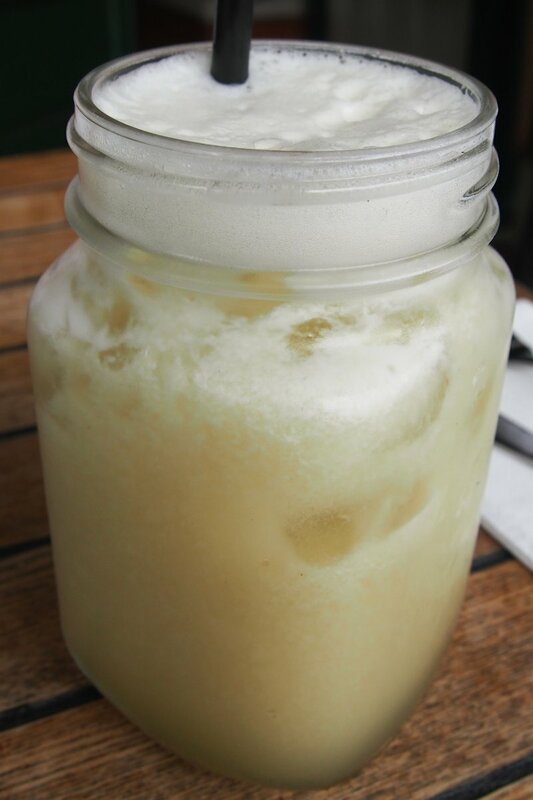 LC’s own homemade limonata ($6.50) consists simply of lemon, sugar and orange and is served ice cold. You can buy it for takeaway as well and they sell over 80 litres of this stuff each week! Add pomegranate or watermelon for $1. The traditional Turkish breakfast ($20) is a fresh savoury and sweet board with a big variety of items. It comes laden with two fried eggs with housemade sucuk (spicy sausage), olives, tomato, cucumer, and Turkish bread just to name a few of the items! 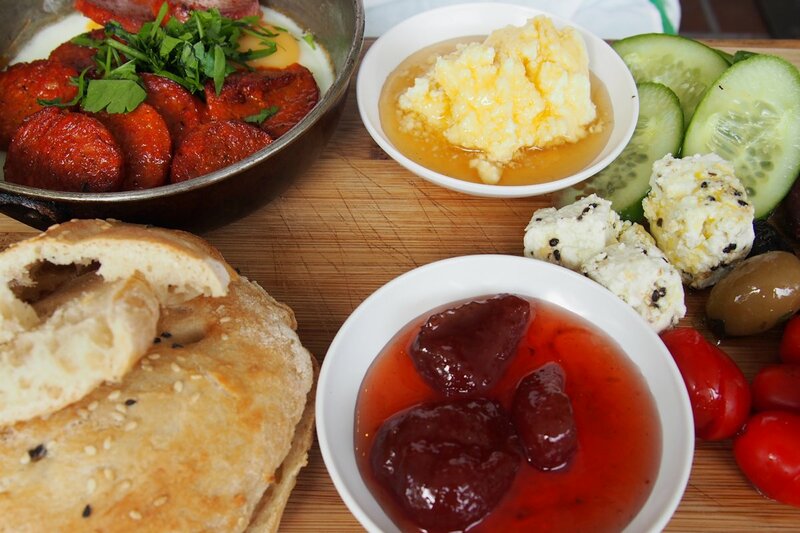 This is as traditional as it comes, an everyday Turkish breakfast that Arda would have eaten in years gone by. The homemade jams are available as mixed berry, strawberry or (now just out of season) quince. Kaymak (similar to clotted cream) is, once again, made in house. They use buffalo milk in this time consuming process. It’s hard to source but preferred because it produces more skin which is what is used for the kaymak. Honey is mixed in to finish off this spreadable masterpiece. 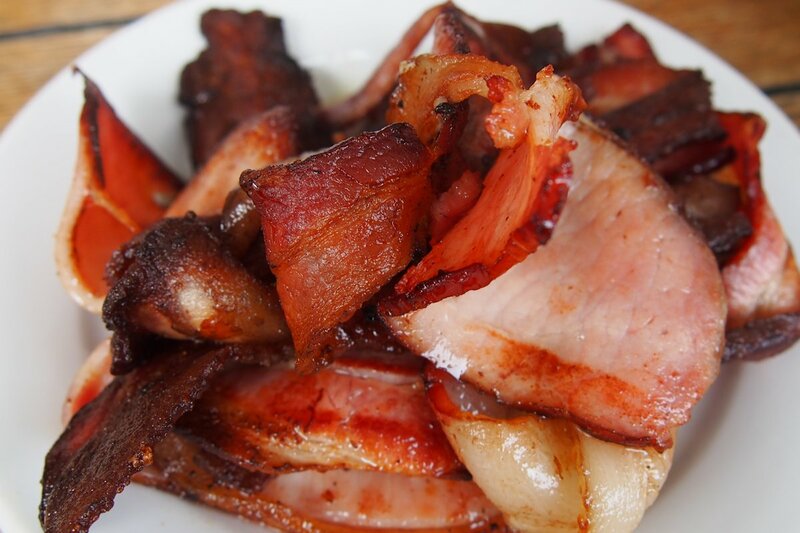 The bacon ($4) on the side was a treat as it was thick cut, crispy and delicious. Shaksuka (baked eggs) is available in two versions at LC: red or green. 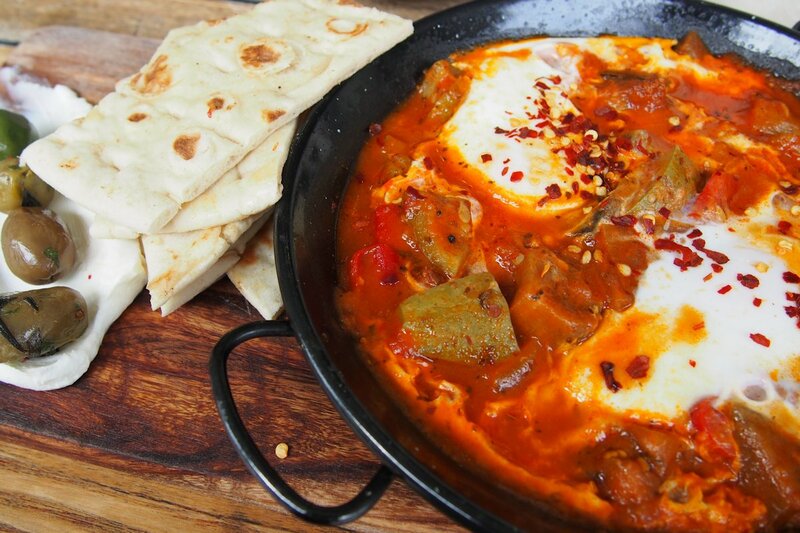 This traditional Israeli breakfast is very similar to a Turkish dish that is eaten without the eggs. The green version is very popular and contains eggs, kale, fennel, onion and feta but I chose the red which has a saucy tomato base and comes with zucchini, eggplant, green chili, minted labneh and two eggs. This had been baked in my opinion just the right amount with a flowing but thicker base and perfectly cooked eggs. Flavourwise, I literally have no qualms; every mouthful was delicious! This is a very large dish so even the very hungry will be left satisfied. Arda recalled a Turkish saying which goes along the lines of “if there’s nothing left on the plate, then there wasn’t enough!” Flat bread was served on the side as well as (of course homemade) labneh and marinated olives. The red chilli flakes on top as well as the green chilli within add a bit of welcome fire. The talent in Arda’s family doesn’t stop with him. His wife, who previously worked at Rockpool with Neil Perry, now offers her skills in the form of all of the housemade cakes, tarts and pastries. This has afforded LC the ability to change from being supplied by three bakeries, to just one (and what they do purchase is very limited) as it’s all home made. 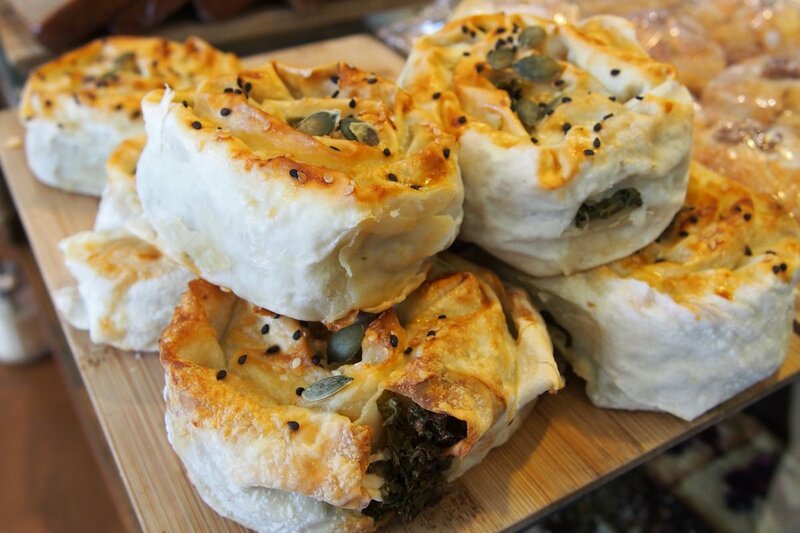 One of the items that I sampled was borek, a very traditional Turkish food. Instead of the usual spinach and cheese, Arda’s wife uses kale, fennel and feta. 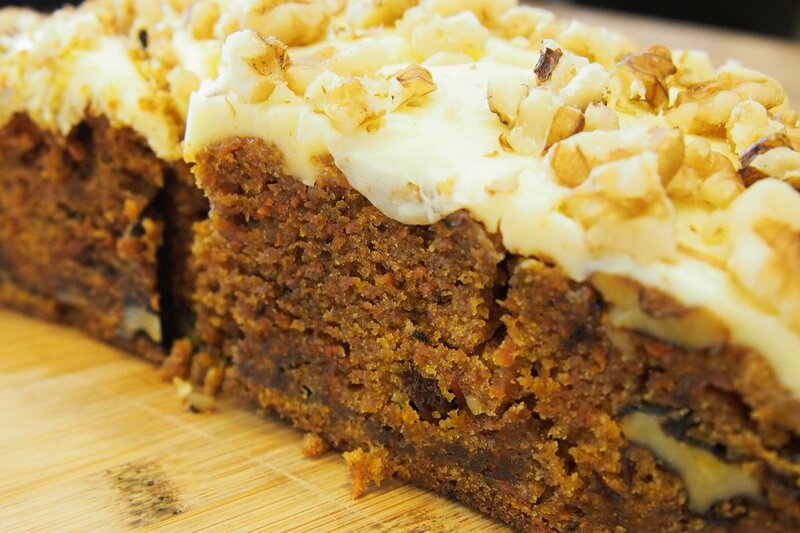 This is a big seller and easily one of my favourite flavour combinations in this review. It was superb and even makes a good on-the-run snack. 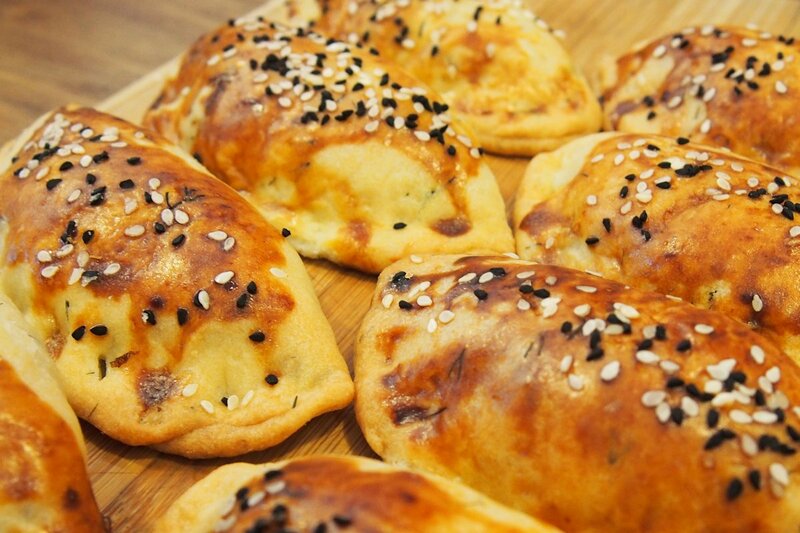 Poğaça is another traitional Turkish savoury pastry filled with dill and feta, normally served with tea. The casing was very light and the feta was crumbly but creamy. More cakes and pastries made by Arda’s wife include carrot cake, caramel slice (Oscar’s favourite), lemon coconut cake, chocolate fudge cake, tiramisu and passionfruit and mango cheesecake. The menu changes often. Not only are there weekly specials but if they sell well enough, they’re added to the regular menu so be sure to let LC know what you think of any special that you try! 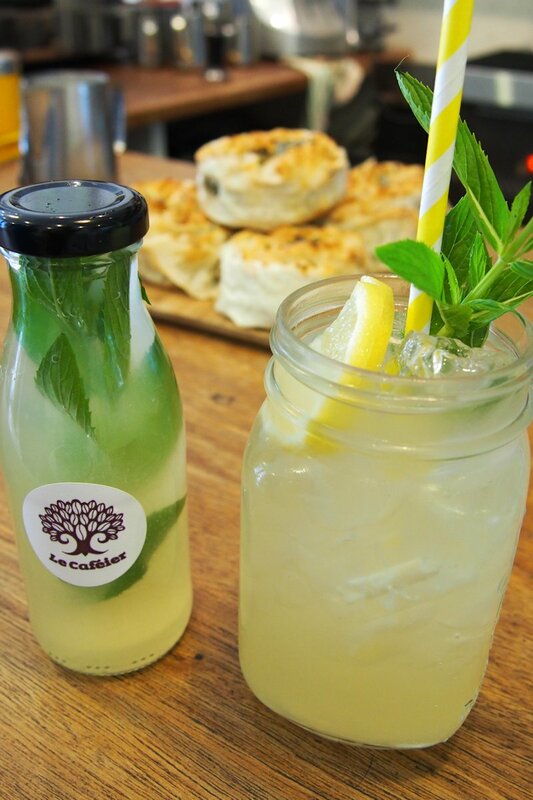 Arda hopes that Le Caféier is the stepping stone to his next venture in the coming years which will be a lunch and dinner Turkish restaurant. He envisions it having the same laid back atmosphere. As with his personality, he wants his customers to feel welcome and at home and if Le Caféier is any indication, it’s going to be amazing! This entry was posted in Sydney - Inner West and tagged Disabled access, Dog friendly, Fresh fruit and vegetable stores close by, Outdoor seating, Parking close by. Bookmark the permalink.